All this steak talk has inspired me to bring to the table one of the hottest foodie topics right now: the pairing of food with cocktails. Here’s a great drink our resident mixologist has sacrificed an afternoon of work to bring you…the Basil Mojito. (Yes, we merely replaced mint with basil). In a rocks glass, drop in 1 quartered lime, a small handful of fresh basil leaves, and one large tablespoon of granulated sugar. We prefer to do the whole thing in a big punch bowl, in which case you multiply all the ingredients by 10. With a muddler, or a wooden spoon, muddle (i.e. “smash”) the hell out of the ingredients. The sugar will help macerate the lime and get all the juice out, and result in a nice layer of thick greenish syrup on the bottom. For the glass, fill with with ice and proceed to pour in Bacardi Limon light rum until there is only a half inch left of room left. Mix using a shaker or a pint glass. Top off with a splash of club soda, stick in a straw and enjoy. The straw will stop the basil from getting stuck in your teeth. If using the big punch bowl, just pour in the whole handle of rum and add a 12oz bottle of club soda. Mix. If you really want to impress , slice a cucumber into thin wheels and use as a garnish on the side of the glass. Make sure you fill your glass with ice before every refill. Warning: This drink will make your guests VERY sociable, and you’ll truly be damned at just how much quasi-straight liquor you can actually drink. It’s really quite remarkable. This photo is not a very good representation of the likeness between Will Ferrell’s character and D.B. Sweeney’s. 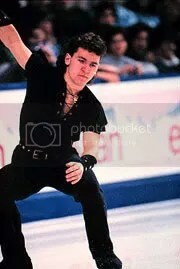 But surprisingly, the internet isn’t exactly swimming with badass fig-skating action shots from “The Cutting Edge.” So I instead decided to use an old head shot of Deeb Sween. In any case, I give “Blades of Glory” five triple salchows and a back flip. Go see it.